Shortcode [wpjb_candidate_membership] displays a page with all active memberships. Memberships are always ordered by price. This shortcode is available since WPJobBoard 5.3.0. Allowed values: integer – ID of membership. Featured membership has an additional class that allows distinguishing your best/most popular offer. Allowed values: list of integers separated by a comma – IDs of memberships. Listed pricing overrides default list of memberships and displays only memberships listed in this param. Displays only memberships with id 4 and 8. 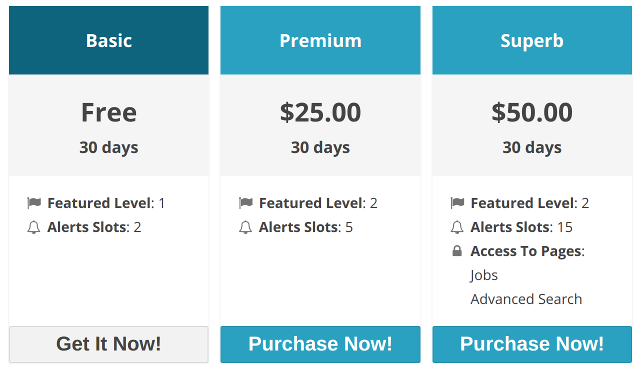 You can set featured membership while editing the membership from wp-admin / Pricing / Candidate Membership panel. In edition form, you should be able to see field “featured”. In section “Shortcode Pages” you should be able to see a row with [wpjb_candidate_membership] as a label. Set correct page in this row using the drop-down field.